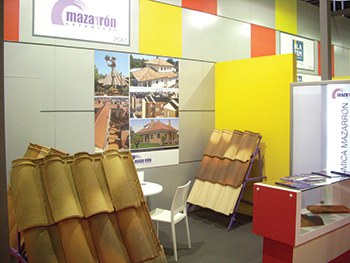 Ceramicas Mazarron’s stand at a previous The Big 5 Saudi expo. Ceramicas Mazarron, a respected Spanish company dedicated to the manufacture of bricks and tiles, is returning to The Big 5 Saudi after a three-year gap to launch its new Optima roof tiles in the market. The group of companies manufactures different types of glazed, satin clay roof tiles with amazing finishes and wide range of colours. Export manager Cesar Gil tells ABDULAZIZ KHATTAK of Gulf Construction magazine, the company has decided to exhibit at The Big 5 Saudi in order to tap the vast business potential the Gulf region offers and especially Saudi Arabia, which is the largest economy in the Arab world and amongst the top 20 worldwide. “Saudi Arabia now accounts for 45 per cent of the total construction industry in the Middle East and is poised for tremendous growth over the next five years with 700 new projects set to be launched in the coming months that are targeted for completion by 2022. These include projects like the Faisaliah City in Makkah, Dahiyat Al Fursan in Riyadh, and Al Ruwais Redevelopment and New Jeddah Downtown, in Jeddah,” says Gil. He says the company has embarked on a plan to increase sales in various parts of the world, adding it has a good presence in the Gulf countries and already sells on a regular basis to the UAE, Iraq, Oman and Qatar. Ceramicas Mazarron also intends to expand and launch new products to suit customers’ taste and requirements. “We want to be a reference company in the Gulf region and participate in beautiful and iconic projects that will allow us to contribute our expertise to the area and Saudi Arabia,” says Gil. A family business, Ceramicas Mazarron launched operations in 1972 in Toledo, Spain, as a brick manufacturer and in 1990 extended its range to roof tiles. It is the third largest manufacturer in Spain with a production capacity of over 30,000 roof tiles per day. “Thanks to continuous efforts, the use of latest technology and the development of innovative improvements in our production process, we have become one of the most important companies in our home country Spain,” says Gil. Last year, it completed the upgrade of its production lines to the H-Cassette manufacturing process, which involves the use of individual ceramic supports that keep each roof tile isolated from the other, thus enhancing the finishing of the tiles. “Our roof tiles will now feature and benefit from plaster moulds combined with the H-Cassette technology that ensure they meet most international standards and certifications,” he adds. Ceramicas Mazarron has a strong presence in its home country with representatives and sales teams spread all over Spain. Globally, its products can be found in 65 countries across five continents. Ceramicas Mazarron is exhibiting at Stand 2C 28 at The Big 5 Saudi.